Forums » General Discussion » Home Theater » Rebuilding TV wall. Advice? #368662 - 03/04/12 04:03 PM Rebuilding TV wall. Advice? Just bought this house. This is the old setup for the family room. There is a 42" or so TV there now for perspective. The new TV is a 65" Panasonic Plasma already owned (yes I know LCD would be better in this room). Will be redoing the whole wall to fit the new TV. Budget is flexible. The main purpose will be 85% TV, 10% movies, and 5% music. This is supposed to be a casual experience so absolute volume and max fidelity are not critical but I would like a good setup. There is a basement theater coming soon so movies are not critical. The ceiling behind the couch has the same speakers you see in the front ceiling. I'll probably leave those in for surround if they are sufficient. They are an unknown brand. I don't have access to the house yet to check them out. how deep would you guess that recess is 2-3'? I have M60's and my speakers are 14 3/8" away from the wall, and my VP180 is 12 1/4" away from the wall... That is measured the closest point of the speaker to the wall. The M60's are toed in.. If i had just bought a house with a room like that, i would do like you said, make the TV area bigger, keeping it in the center. Then i would get rid of the L/R shelving area's. I would also put some cloth material on the L/R recesses so that the speakers are not inside a tunnel, I may or may not keep the top 2 shelves on the L/R. You may/may not need that shelving for components/or dvd's.. If you have no use fr them, then i would get rid of those shelves.. how large are the shelves behind the glass doors? if they are about 19" now, when you rebuild the area, you will loose some of that room.. Which may result in your being creative with the wiring for your receiver/processor/amps/DVD player, what ever components you are using in that room. Do you have a center channel? For that size of a room a VP160/180 would be ideal in my opinion as that is a pretty big and open room. Again, if it were me, i would attempt to keep my VP180 about 12" from the wall, and try not to box it in to much. Not knowing what speakers you already own, or if you do own any for this room makes any advice kind of difficult. If you do not already own speakers, i would say go with all incabinet speakers, as it will make your life easier when "rebuilding" that wall... just make the correct size holes for the speakers, slide them in and done. I think for what you want and already have in the room will be sufficient for now and spend all your money on the basement HT then come back to this room and adjust accordingly. AB, at this point I'd tend to agree with Jason: concentrate on the HT in the basement. After you've heard how those ceiling speakers sound for TV watching you'd have a better idea as to what, if any, improvements you'd want to make. The room is a clean sheet. The whole cabinet will come out and a new one built in it's place. Some might be saved, but the 65er is a lot bigger and won't fit in the cabinet. I have m60s, a vp100, a SVS pb12 nsd, and qs8s. I plan on using most of those in the theater with an upgrade to a 160, so the vp100 will be available, but I don't want to compromise on the equipment for a custom cabinet. Do it right the first time. The speaker cost is immaterial here. The cabinet is maybe 2 feet deep. I'm not leaving this room as is. I'll be in this house for 30 years so I'm doing it right and doing it now. The theater will take much more effort so it comes second. I didn't want to taint any suggestions with my thoughts, but I'll go anyways since that probably tells you how far I am willing to go. I was thinking about in cabinet m60s. Their height is the same as my TV which makes the cabinet come out looking nice. I was wondering if I could mount them upside down so the tweeter is at the bottom of the TV, more in line with the center. For a center I was thinking I could do 1 of 2 things, 160 below the TV, or a slot for either my vp100 or a vp150. The slot is probably a better look than the large 160 and will allow more drawers in the cabinet design. Since this is for TV mostly, I was thinking I could get away without a sub, but I will build a cabinet in the bottom left corner that could fit a sub and I'll prewire it but I'll probably do shelving there instead. If I decide I need a sub, I can add one. So, any ideas on this? Should I go m80s instead? or maybe m22s and a sub? What shoudl I do with the center? Can I mount the m60s upside down? If i was in your shoes, i would not go any smaller than a 160 for that room... I have a 17'X18' family room with 8ft ceilings.. i had a vp150, and the 180 that i have now in my opinion is a better match... 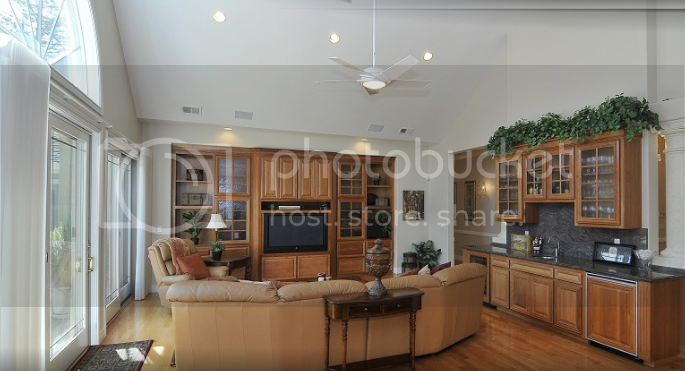 When you figure in your vaulted ceilings, you have much more cubic space than i do, not counting adjacent rooms. I dont think that i would personally worry to much about keeping all of the tweeters in line.. My center channel is on top of my 60" 2000ish era DLP... So, my center is probably 2-3' higher than my M60's, i have it angled down and it sounds find to me.. The incabinet M60's are just over 15" deep, so you should be good with depth for them. The incabinet VP180 is 17 1/2" deep, they do not have the incabinet 160 listed. However, i think they are in production?? I don't think the 160 would be any deeper than the 180.. I have an SVS sub right now in my current family room that is turned off most of the time. TV just doesn't seem to play well with a sub capable of low extension. Dancing with the Stars is probably the worst offender, though we haven't watched that show for years. So that's why I'm ok leaving out a sub. But I do want to have enough bass to make music sound good, and to give action scenes some punch. I don't need to feel it in my chest, but I'd like to be able to hear it. My setup now with m60s providing the bass is quite good, though it is in a much smaller room of about 16x20 that opens to the kitchen from an 8 foot wide opening. I'll use this system way more than I will ever use a theater. I spend the vast majority of my time in my family room enjoying music, TV, and movies while caring for my 5 month old twins. So this project comes first. I would just tear out the entire cabinet where the TV is currently mounted. That would then make a decent background for a 70-80 inch tv with a pair of M80's to either side. This looks like a great opportunity for in cabinet speakers. I'd probably go with M60's. I'm not sure if Axiom is making an in cabinet VP160 yet, but they do have an in cabinet VP180. I suspect they'd make you an in cabinet VP160 if you asked. As far as a sub in concerned, there's no where to hide one in that room, so I'd go big and good looking. EP600 is maple or rosewood?